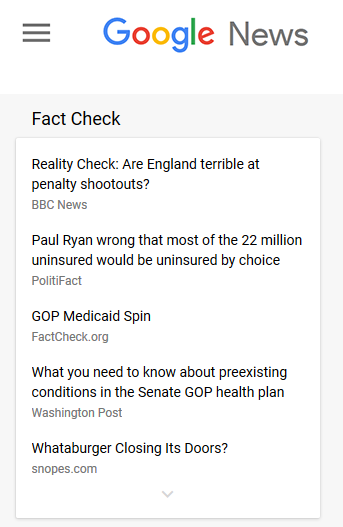 FactCheck.org featured in Google News’ new dedicated fact-checking section. Google has launched a redesigned Google News, which separately displays fact-checking stories from news organizations and websites such as FactCheck.org. The redesign aims to improve navigation and accessibility, with “a renewed focus on facts, diverse perspectives, and more control for users,” according to Google’s June 27 announcement. The new “story cards” feature will present different perspectives on issues, while a dedicated box labeled Fact Check on the right-hand side of the main news page will display top recently published fact-checking articles from FactCheck.org, the Washington Post, PolitiFact and others. The update come as part of Google’s ongoing efforts to increase access to factual information. Google announced in April that, in addition to being featured more prominently in search results, the results from fact-checking organizations will clearly display what the claim is, who made it, and what the fact checkers found. When publishers use tools such as the Share the Facts widget, developed by the Duke Reporters’ Lab and Jigsaw, Google can pull the relevant information directly onto its results page. FactCheck.org, a project of the Annenberg Public Policy Center, is also one of the independent news organizations working in partnership with Facebook to improve fact-checking and expose viral fake news shared on the social media site, as announced in December 2016. Stories found to be false by FactCheck.org or another fact-checking outlet may be flagged as “disputed” in Facebook’s news feed, appear lower in the feed, and be accompanied by a link to a related fact-checking post. FactCheck.org’s page debunking fake news is here. In addition to its core mission to “reduce the level of deception and confusion in U.S. politics,” FactCheck.org works to expose and debunk fake claims via its Ask FactCheck feature, produces content on spotting fake news, and checks science-based claims on SciCheck. Check out FactCheck.org’s article on how to spot fake news and video on spotting fake news.